In Erik den Breejen’s first solo exhibition at Freight + Volume, his love affair with music and lyrics manifests itself by way of brightly colored, abstract, text-based paintings. Using a wide variety of devices, the artist infuses paintings that reference many modes of abstraction with pop culture. By treating the words as shapes, den Breejen generates conceptual narratives and explores a personal take on movements such as minimalism, “action painting,” grid and color-field painting, and hard-edged geometry. The exhibition is a myriad of crude, yet sophisticated, pop-art canvases in which den Breejen plays conductor to a visual symphony starring his rock heroes. Like an impassioned fan, Erik den Breejen’s paintings are in part an homage to his favorite songwriters and in part an expression of his personal interpretation and experience of powerful lyrics by bands like the Who, Pink Floyd, Roxy Music, Jarvis Cocker, Magnetic Fields, Elliott Smith, glam bands from the 70’s, and select hit songs of today. Den Breejen lives and breathes emotion through song lyrics; the fervor and the fandom that the music fuels within him become his muse. He examines how we are influenced by words – lyrics in particular - that suggest ideas of the ways in which we believe certain romantic and philosophical “truths”. In some of the new work, the text becomes nearly illegible, verging on subliminal messages, forcing the viewer to work for the plot. Layers of melodies sit atop of each other in a multitude of color combinations, offering a raw treatment to these rich catch-phrases. Erik den Breejen once recited from memory all of the lyrics to Pink Floyd’s The Wall. 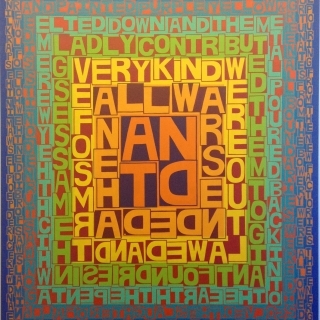 For Throwaway Lines Often Ring True, he offers another take on this text - the centerpiece for the exhibit - a monumental 9 by 7 foot canvas, featuring all 2,300 words from the 26 songs in the album. Likewise, The Real Me focuses on the track by The Who of the same name, layering its words onto other songs from the band’s double album rock opera Quadrophenia. In the project space Russell Nachman will present a group of new watercolors, which explore his distinctive brand of melded histories: the personal and the cultural. In some works, expertly rendered backdrops are littered with relics of yesteryear, alluding to dramas recently enacted. Other pieces depict the alleged players who once occupied these scenes. Nachman's work is a meditation on utopian dreams and the erosion of human experimentation. He believes that reckoning with the past and present is a way to negotiate paradise and understand happiness through loss. Russell Nachman has had several solo shows including Sixspace Gallery, Los Angeles, CA; Jack the Pelican, Brooklyn, NY; Mixed Greens, New York, NY; and White Columns, New York, NY. He currently lives and works in Brooklyn, NY.